So, how glamorous does meatloaf sound? Personally, I thought Bat Out of Hell was a fine album, though I wouldn’t say he sounds glamorous. Er, wait. Wrong meatloaf. Poor jokes aside, the dish generally doesn’t sound that elegant either, but this recipe makes me weak in the knees. It’s one of those meals that I think about far too often. The problem with most meatloaf– aside from the unappetizing name– is that it’s usually a bland brick that’s really only edible when covered in a pile of ketchup. I always think of the grade school lunch variety. This is a whole different experience. Just look at that bacon! And if you’re ready to move on from Thanksgiving leftovers, this hearty version is perfect. 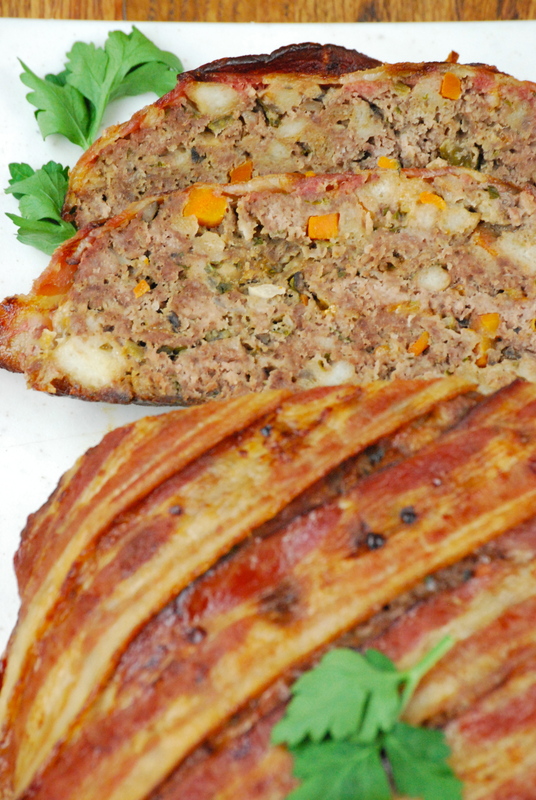 So what makes this meatloaf different? What makes it special? As always, it’s the ingredients. Aside from the carrots, celery, and onions that form a good base, this dish relies on mushrooms for a complex earthiness. There’s also cheddar to add more depth, texture, and a hint of saltiness. And beer. I used one of Radd’s home-brewed dark stouts, which worked nicely with the mushrooms and cheddar. Finally, there’s the bacon. Wow. It makes the dish. 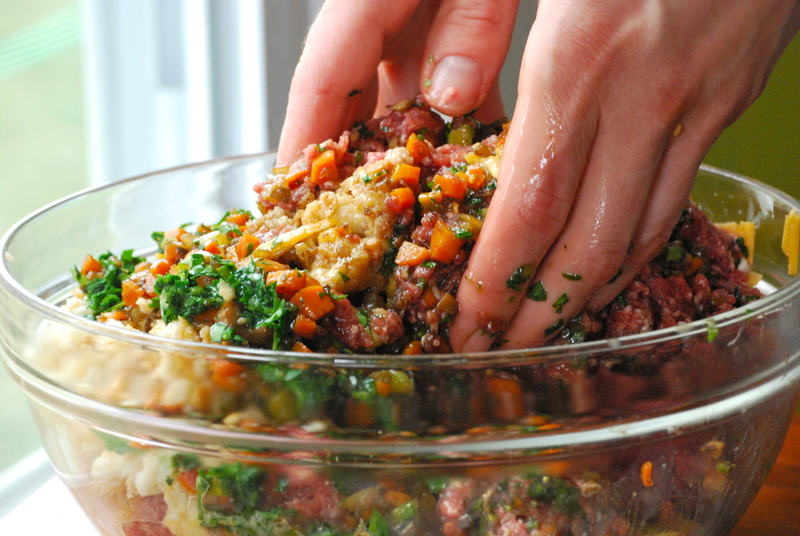 Not only does it add so much flavor, but it helps keep the meatloaf juicy. Keeping this meal moist is key, so aside from the bacon, the milk-soaked bread is essential. This meatloaf would be a wonderful centerpiece meal, accompanied by several sides, but– to be honest with you– I made it for sandwiches. I was craving a to-die-for meatloaf sandwich and I got it. I cut a nice thick piece and put it on a ciabatta roll, covered it with a bit of mayo and harissa and a mound of hot peppers. Amazing. I also found that it was incredible when paired with the homemade ketchup I made this Summer. I’m not sure which one I like better, so I’m tempted to make another meatloaf just to find out. Heat the oil in a 10- to -12 inch skillet over medium heat. 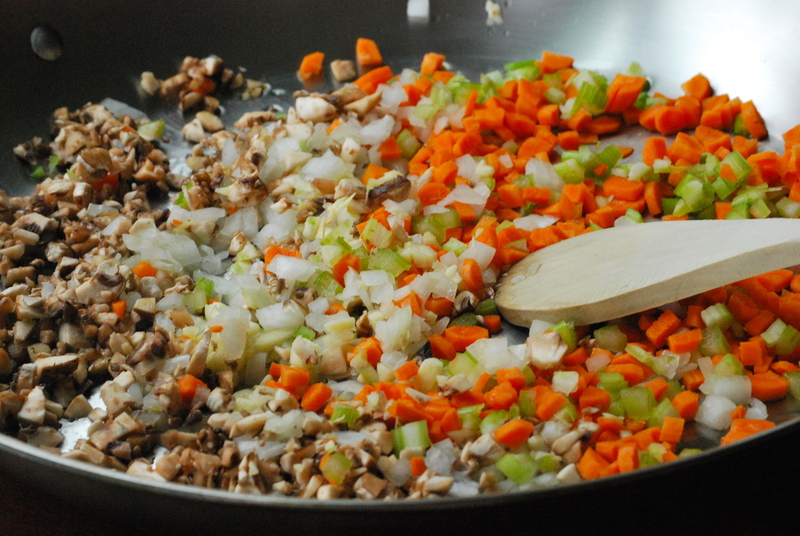 Cook the onion, garlic, carrots, celery, and mushrooms until softened and just beginning to brown, about 6-8 minutes. Add the stout ale and simmer until almost all of the liquid is gone, about 4-5 minutes. Transfer to a large bowl and let cool. Meanwhile, in a shallow dish soak the bread and milk, flipping once, until soggy but not falling apart, 5-10 minutes, depending upon the freshness of your bread. 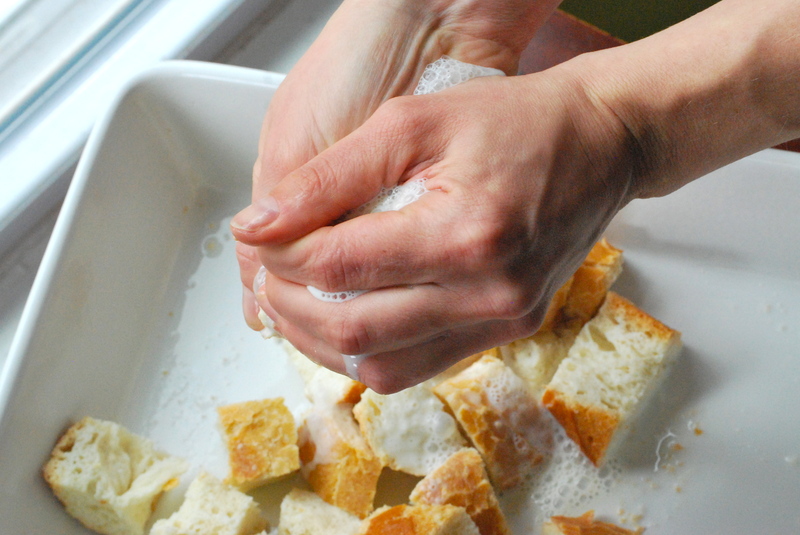 Gently squeeze the milk from the bread with your hands. You will want the bread to be moist, but not drenched. Finely chop the bread and add to the bowl of cooked vegetables. Position rack to center of oven and pre-heat to 375°F. Begin to add the remaining ingredients to the bowl of vegetables and milk soaked bread — ground beef, eggs, salt, pepper, Worcestershire sauce, parsley, and cheddar cheese. Use your hands and gently mix all of the ingredients until just combined — try not to compact the mixture as you do this. Line the bottom of a large rimmed baking sheet with parchment paper. Put the meatloaf mixture on the pan and form a 10 x 4 – inch rectangular block (it will become loaf shaped as it bakes). 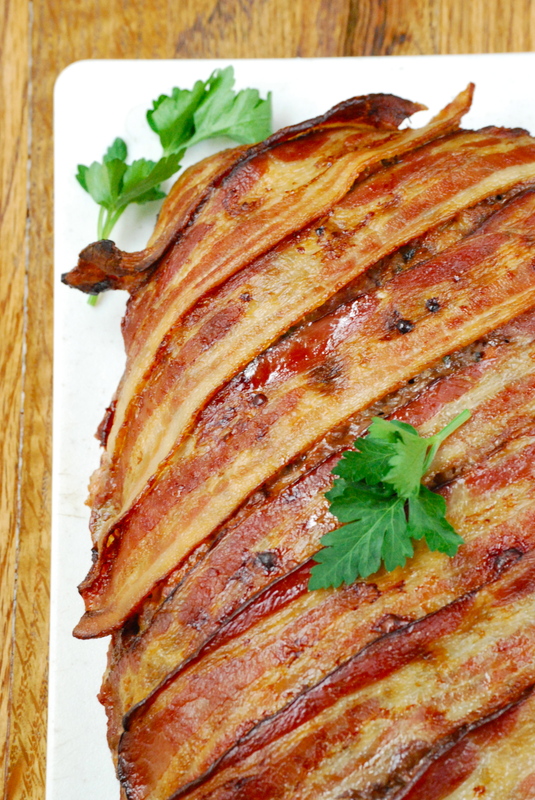 Wrap the meatloaf with the bacon in a diagonal pattern. Leave a 1/2- inch over hang around the edges and tuck under the meatloaf. Some pieces of bacon will need to be trimmed. Bake until an instant read thermometer inserted into the center of the meatloaf reads 160°F, 50-60 minutes. 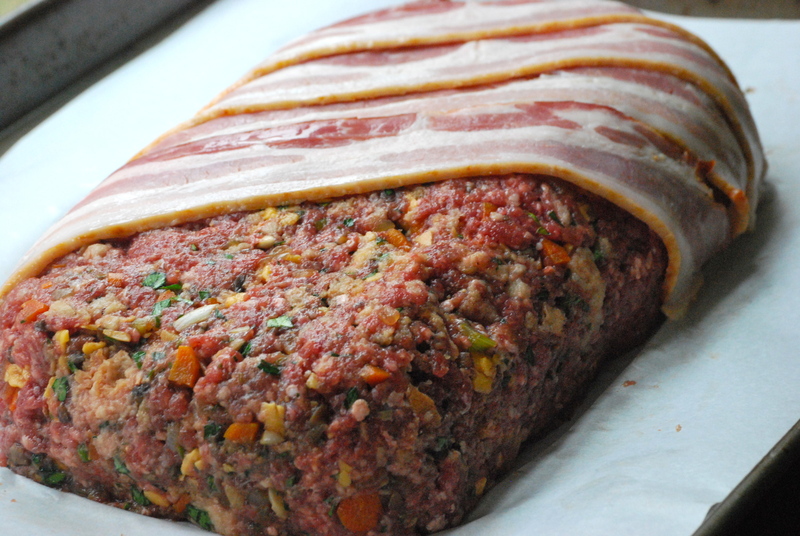 Then, broil the meatloaf 6-inches below the heating element until the bacon is brown and crisped, about 3 minutes. Let rest for 10 minutes before serving. Enjoy! Laurie, Laurie, Laurie….this looks fantastic!!!!!!!!!!!! That looks delicious! Will be making this for my american friend when she next comes over for dinner ! Mercy! This looks amazing. Can’t wait to try it!! Made your Cheddar and Stout Meatloaf. My family really enjoyed it!! I do some work with your husband, and he turned me on to your blog. Of course I know who you are, Laura! I look forward to the caramel apple from you every year. 🙂 Glad to hear you enjoyed the meatloaf. We had this for dinner and it was excellent. The texture and moistness are perfect. Having no stout in the house I substituted chicken broth which was fine. Tried this meatloaf recipe for dinner last night. My wifey and my mother both loved it. It truly is delicious. However, in my mind, meatloaf HAS to have ketchup or tomato paste on the top. This is definitely a do-again at our house, but next time I will be adding ketchup or tomato paste on top.